Ninjak is one of the main heroes of Valiant Comics. He basically is a mixture of James Bond and a Ninja. Ninjak was created by writer Mark Moretti and famous Marvel alum Joe Quesada. He has appeared as both a hero and an adversary to different heroes in the Valiant Universe. Ninjak will be portrayed by actor Michael Rowe in the live action web series Ninjak vs. the Valiant Universe. 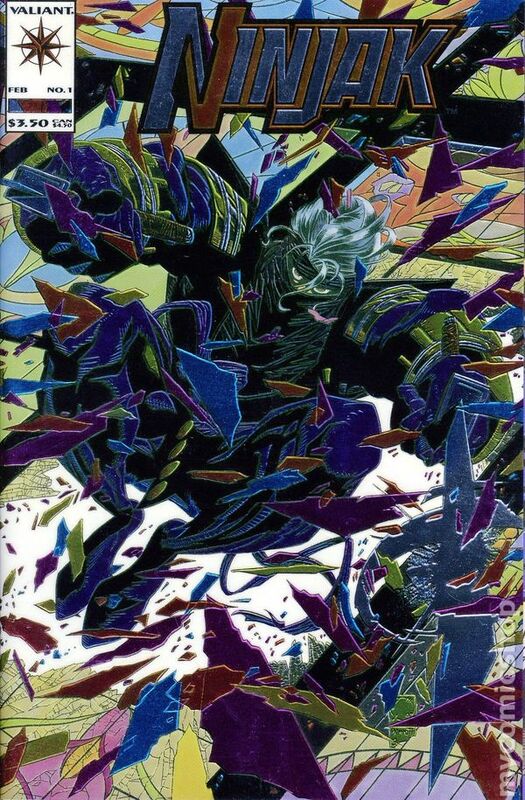 Fun Fact: Ninjak #1 had a wraparound chronium cover that helped propell it in sales making the number 1 selling comic in America in November of 1993. The cover is actually dated for Feb 1994 if you look for it. This made Ninjak the first Valiant issue to ever achieve the feat of being the #1 sold comic in a month. Ninjak is a man named Colin King who has aspects of Bruce Wayne, James Bond mixed with Ninjas. Colin is a wealthy man whose father was a master spy part of the British M16. As Colin father traveled often Colin ended up being raised mostly in Japan. Colin becomes an expert in Japanese culture but also feels like an outsider there. Colin's father was killed by an agent named Iwatsu. Angry at his father's death and wishing to honor him Colin begins to train in arts of Ninjitsu and espionage. He uses his skills and armanent to become a Ninjak a specialist serving the England. Ninjak becomes the primary agent of an organization known as Weaponeer. The Weaponeer organization sends Ninjak out on missions to gather intelligence and remove threats. He uses his Ninjitsu skills, weapons and a bullet proof suit that has a chameleon like ability to match the background. One of his primary jobs at Weaponeer is to distribute weapons produced by Weaponeer to other agents in the field. These weapons include everything from swords to nuclear warheads. The Weaponeer organization is attacked by a terrorist organization called WEBNET. WEBNET is run by the mysterious Doctor Silk who believes that Weaponeer has grown to be too powerful and dangerous. All of the Weaponeer agents are killed off with exception of Ninjak. Without a home organization Ninjak finds himself adrift and considers retiring. He is contacted by Neville Alcott of the British Intelligence M16. Neville used to work with Colin's father and has known Colin since he was a boy. He convinces Colin to join their organization that already includes Bloodshot and Eternal Warrior. He further entices Colin with prospect of returning to Japan on a mission that involves a woman he used to love there. Ninjak has no true super powers but is considered to be one of the most intelligent men in the Valiant Universe and can think very quickly. He has a highly analytical and tactical mind that allow him to predict future situations and make the necessary preparations. He is also highly trained in a variety of skill sets that make him a powerful adversary. Ninjak also has access to a vast array of weapons and items from either the Weaponeer Organization or British Government. Linguistics - Highly adept at speaking languages, can learn a new language quickly including computer languages. Ninjak has a variety of equipment that aides him in missions. The Ninjak suit is made of Kevlar and has adapting color that changes to match the color of his backdrop providing camouflage in any environment. This color changing ability allows him to blend in with any surrounding and bring Ninjitsu tactics to use anywhere at anytime. N Shurikens - Ninjak uses customized shurikens that are golden disks with N embossed them as his signature. When thrown star points that are spring loaded are released. Swords- Ninjak uses collapsible steel swords that can be hidden and easily carried before being removed. Sai - Often keeps a pair of Sai on him and uses them to disarm opponents. Ninjak is the primary character a live action production by Bat in The Sun called Ninjak vs. the Valiant Universe. The series will also feature a variety of Valiant characters including X-O Manowar, Livewire, Armstrong, Bloodshot, Eternal Warrior, Roku, Colonel Capshaw, Faith, Divinity, Timewalker and Savage. Ninjak will be portrayed by actor Michael Rowe who played Deadshot in the DC TV series Arrow.